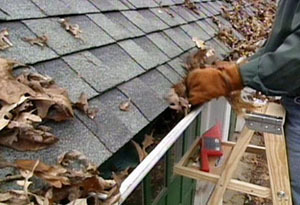 If you are looking to find a professional gutter cleaning service you are at the right place. Our company is an expert in providing gutter cleaning services in London and the area. Very happy with the job your cleaner done, all the gutters were perfectly cleaned. Our company’s aim is to maintain its excellent reputation and we do so, by providing our customers with the best gutter cleaning service available in London. We also have very affordable prices that allow us to help anyone who seeks our service. What our cleaners will do is inspect your drainage system, find the problematic spots, clean it thoroughly and then get rid of the problem. Do not worry, even if your gutters or downpipes are clogged, our skilled cleaners will unclog them. 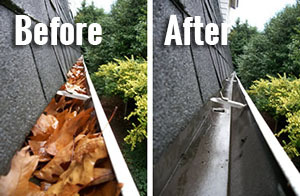 Our cleaners will remove all debris, objects, leaves, grime and mould from your gutters. For the purpose they are equipped with gutter-friendly ladders that allow our cleaners to reach your gutters without endangering them by using them for support. And for the gutters that are higher and for the tallest downpipes, they have special vacuum machines attached to telescopic poles, which allow them to clean them efficiently from the safety of the ground. Hire our gutter cleaning service for regular cleaning sessions and maintenance, and have a peace of mind that your home will be protected from the rain and potential floods or other roof problems.